I bought the Oh She Glows cookbook by Angela Liddon 2 months ago and I don’t know why it took so long to bake these cookies. I bookmarked them and a couple weeks ago finally got to making them. Angela is a Canadian blogger who I’ve followed for a few years now and I love all of her recipes – bonus that she’s a fellow Canadian! It was a big mistake – because now I will want to make them all the time. Lucky for me they’re slightly healthier than regular cookies, and freeze easily so you can save them for later when you have a cookie craving. 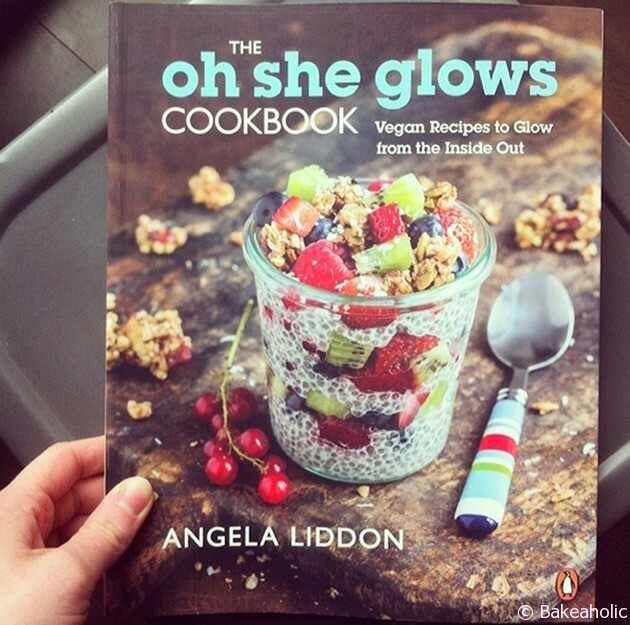 Angela’s book is full of delicious vegan recipes, and some gluten-free too which is great for me. I like making my own oat flour with gluten-free oats. You can change the nut butter to any you like, I’m sure peanut butter would be equally delicious. 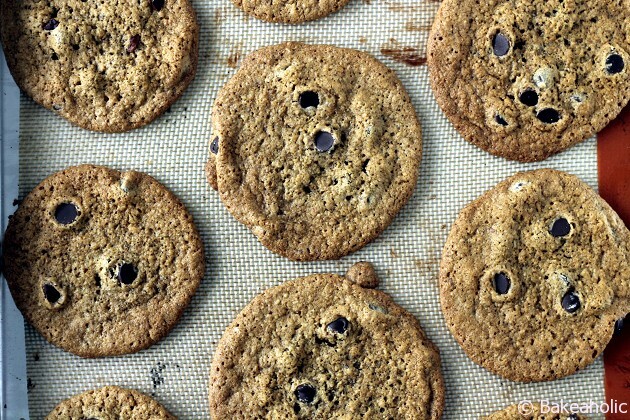 These cookies are what I like to call “bakery-style” cookies – big, round, chewy and crispy. The type of cookie you would find at a bakery counter. They would make great ice-cream cookie sandwiches too. I made a big batch for Adam to bring with him to work – I’m not sure how long they lasted. 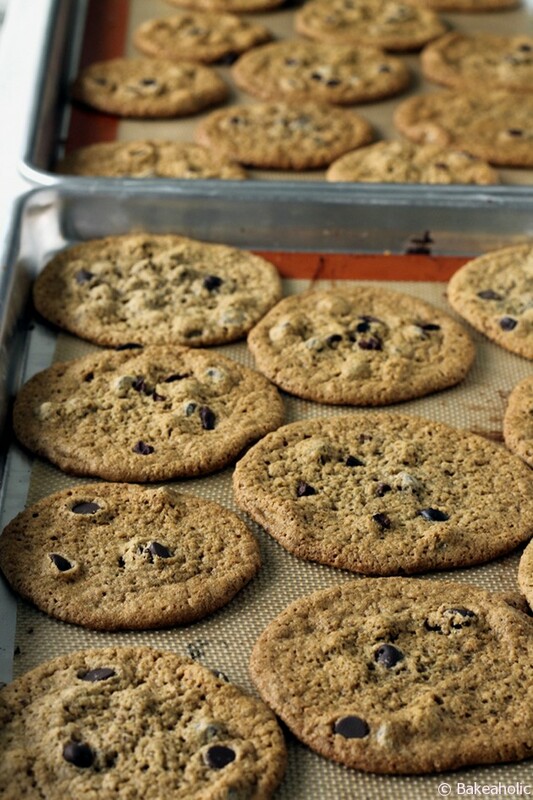 Crispy around the edges, chewy in the middle nutty chocolate chip cookies made with almonds and oats. Naturally gluten-free. Preheat your oven to 350 degrees. Line baking sheet with Silpat liner. Set aside. In a small bowl blend your flaxseed and 3 tablespoons of water together and set aside. This will thicken up and replace the egg in this recipe. Set aside for about 4-6 minutes. In your stand mixer, paddle attached, blend coconut oil and nut butter until combined. Add both sugars and beat for 1 minute more. Beat in flaxseed mixture (or egg) and vanilla until combined. One by one, beat in the baking soda, baking power, oat flour and almond meal. The dough should be lightly sticky. If your dough is dry, you can add a touch of almond milk to thin it out. Fold in chocolate chips. Using cookie scoop or spoon, scoop 1-inch balls onto prepared sheet. 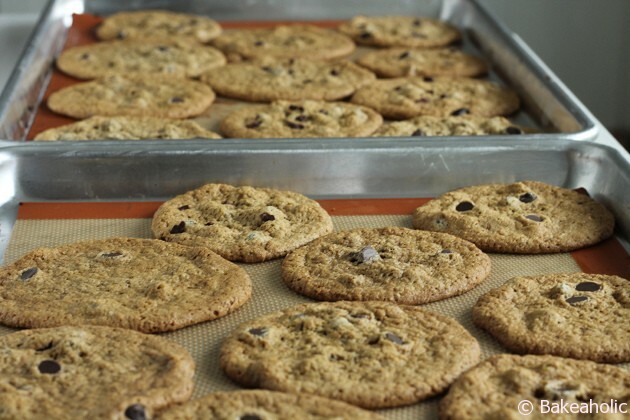 Leave 2-3 inches between each cookie as they spread. There is no need to flatten the dough before baking. So delicious - definitely a favourite in the book. They freeze easily, and taste great even right out of the freezer cold. These are absolutely amazing and addictive. I substituted coconut sugar, too. Delicious!